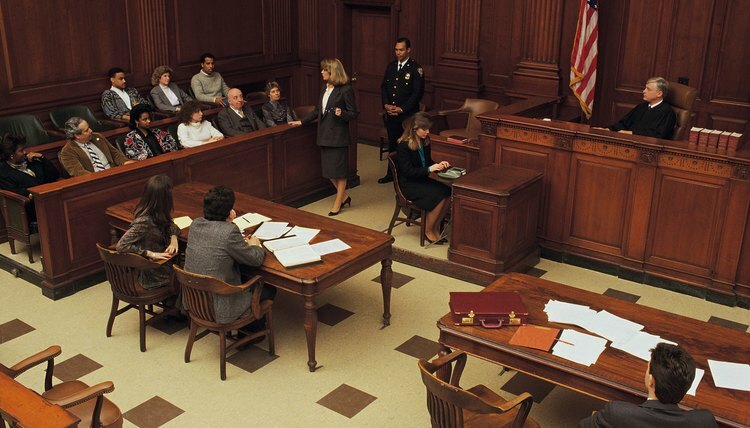 A civil judgment is official only if it was granted by a court as part of a lawsuit. The process begins with a person or company filing a complaint against you, perhaps as a result of payments owed on a credit card or allegations that you injured someone during a car accident. Both sides have the opportunity to present their story to the judge. If the plaintiff -- the person or company who filed the lawsuit -- is successful in the lawsuit, he may receive a judgment against you, meaning you owe him money. If you do not pay the plaintiff the amount owed as a result of the judgment, he has options to get his money. Depending on the laws of the state, he may report the judgment to credit agencies, enter a lien against your home or garnish your bank account or wages. Wage garnishment requires your employer to withhold a certain percentage of your wages to pay directly to the plaintiff instead of you. It generally is allowed only if you make more than a certain amount of money. Once a judgment has been entered against you, you may have several options for handling the judgment, including bankruptcy. The plaintiff may be willing to work out a payment plan with you to pay off the amount you owe over time or accept a smaller amount of money if your only alternative is bankruptcy. Filing for bankruptcy may stop garnishments and result in you no longer being responsible for paying the judgment, depending on the facts of the case. Only certain types of debts can be discharged under bankruptcy, meaning that bankruptcy eliminates your obligation to pay those debts or judgments. If the judgment was for student loans or taxes you owed, bankruptcy will not likely discharge the debt. Further, if the judgment came from a lawsuit regarding a drunk driving incident or malicious and willful act, such as where you assaulted the plaintiff, the debt from the judgment will not be discharged by bankruptcy. Can You File Bankruptcy on Funeral Expenses?